A new-build 36.6 metre motor yacht called the Tecnomar Evo 120 has been listed for sale by Jonathan Browne and Tim Quinlan at Ocean Independence. Currently under construction in aluminium by Italian yard The Italian Sea Group at its Tecnomar division to a design by Nuovi Cantieri Apuania, delivery is scheduled for 2018 and she will be RINA classed. Although her interior layout can be changed, she is currently configured to accommodate eight guests in four cabins and there will also be three cabins for five crew aboard this yacht for sale. Guest accommodation consists of a full beam master suite with an office and vanity area, a VIP suite to starboard, a port twin with a sauna/spa room and an aft twin with a Pullman berth. All cabins will have en suite shower facilities. The main deck saloon remains open to her new owner’s requirements and currently allows for an aft lounging area with a bar and entertainment centre with a forward dining area seating eight guests. The galley has the option of containing an American-style dinette for casual meals and there is also provision for a cinema room with loungers and fixed furniture. A substantial flybridge will offer a bar, fridge, ice maker, barbecue grill, Jacuzzi spa tub and sunbathing areas with a Bimini top. Twin 1,920hp MTU diesel engines will give her a range of 1,600 nautical miles at 10 knots. 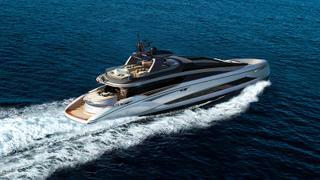 Available to view at the yard, the Tecnomar Evo 120 is asking €12.9 million.